By the end of March, The Corsi Group plans to start producing cabinets at its 97,000-square-foot facility called Siteline Cabinetry in the Charlotte County Industrial Park in Keysville. It’s a solid start for the Indianapolis-based cabinet manufacturer, which announced last spring it would invest $5 million and create 110 jobs in opening its first Virginia operation. “I think it’s going to be a huge impact,” says Susan Adams, the economic development associate for Charlotte County. The Corsi announcement is the biggest deal made last year in the region served by Virginia’s Growth Alliance in terms of projected number of new jobs. Virginia’s Growth Alliance is an economic development organization serving Amelia, Brunswick, Buckingham, Charlotte, Greensville, Lunenburg, Mecklenburg, Nottoway and Prince Edward counties and the city of Emporia. Corsi, which makes and sells kitchen and bathroom cabinets, will produce a new cabinet line at the Keysville facility. The Indianapolis-based, privately owned company was founded by Pat Corsi, its chairman and CEO, 42 years ago. Besides Virginia, it has plants in Indianapolis and Elkins, W.Va.
“We are seeing a lot of growth that’s going on both in the remodel industry and new construction, and we want to take advantage of that and be a part of it,” says Corsi President Ken Pfarr in discussing the company’s expansion into the commonwealth. Corsi had taken a good look at Southern Virginia several years ago when it was considering an expansion before the Great Recession hit, says Jeff Reed, executive director of Virginia’s Growth Alliance. Company officials revisited the region when an improving economy again raised the possibility of an expansion. Pfarr says logistical considerations such as access to East Coast customers and the availability of supplies played a part in the decision to locate in Virginia, but company officials also felt comfortable in Charlotte County. “We just liked the people,” Pfarr says. Reed also says Corsi officials appeared to be impressed with the area’s workforce initiatives, like the woodworking training program offered by the South Boston-based Southern Virginia Higher Education Center in partnership with Danville Community College. Pfarr says the company already is in talks with Southside Virginia Community College to devise other employee-training programs. In addition, Corsi received economic development incentives, including a $100,000 grant from the Governor’s Opportunity Fund and a $375,000 grant from the Tobacco Commission. 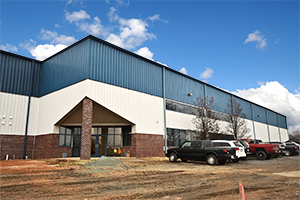 The factory also is in a Virginia Enterprise Zone, which made Corsi eligible for local grants. Pfarr says that when a company is expanding, incentives are extremely important. “Without the help of the state and the county, it is extremely difficult to do a startup because ... all you’re doing is spending money for one to two years before you ... start to see a profit, so it becomes very important to get as much help and incentives as you can find,” he says. Besides Keysville, Corsi considered sites in Indiana, South Carolina, North Carolina, Tennessee and Kentucky. “This time we did not have a predetermined area. Our interest was more in logistics, labor force and available industrial areas to set up our facility, so that’s why we looked at so many states,” Pfarr says. He says Corsi’s Keysville facility will have more employees and output than its other plants. He projects the plant will produce about 2,000 kitchen cabinets per week. Positions at the plant will range from machine operators and assemblers to forklift drivers and supervisors. Pfarr estimates that the average wage will range from $12 to $13 per hour. During the site selection process, vetting of qualifications was a two-way street. County officials also traveled to Corsi’s plant in West Virginia to make sure that the company’s culture was a good fit for its workforce. “They had a great reputation and, I think, what they have there will work here as well,” says Adams, the county economic development official.